We developed a temperature control heater/cooler device that answers any type of cells needs for microscope imaging. Our system features an ultra fast temperature shift: 5 to 45°C in seconds, to circumvent thermal gradient-generated artifacts and microfluidic technology, to prevent fluid flow shear stress on the sample. We specifically designed it to reach below ambient temperature to allow cytoskeleton, endocytosis and high-resolution imaging. We made sure that the system is plugged and play and fits any microscope setting. 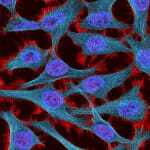 Need advice to control microtubule assembly using temperature ? 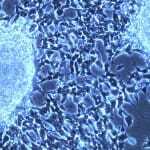 At the cellular level, many processes are temperature regulated. For instance, incubating cells on ice for 30 min is sufficient to induce microtubules depolymerization. At 19°C, endocytosis is arrested and at lower temperature vesicular transport is blocked. 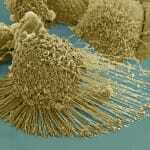 Protein aggregation can also be induced with low or high temperatures. Moreover temperature-sensitive spontaneous mutations or engineered mutations have allowed to specifically control any genes of interest. 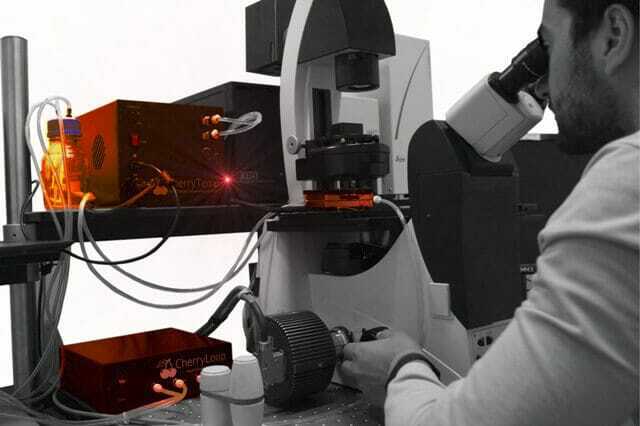 All of these processes are very fast acting, and combining them with live cell imaging requires a device that can change temperature very quickly, that is robust, and respect cell integrity by preventing shear stress. Here, we present the development and validation of ElveflowTemp, a temperature controller for cell biology microscope imaging. 1. Temperature controller device. Our device is using microfluidic technology with a PDMS chip composed of microchannels allowing the circulation of thermalized fluid. The chip is crosslinked to a coverslip and is connected to Peltier devices set at two different hot/cold temperatures making possible to quickly change from low to high temperatures. Our ElveflowTemp electronically controls the Peltier element. In our system, the fluid is never in contact with the sample, preventing any shear stress. 2. Cell culture. GFP-Atb2 (tubulin) expressing HeLa cells were plated on glass coverslides onto which we added biocompatible tape to delimit the cultured area. Cells were cultured with DMEM 10%FBS, at 37°C, with 5% CO2. The day of the experiment, coverslides were harvested, and one drop of medium was added onto the cells, we then simply placed the ElveflowTemp chip/coverslip onto them and started the temperature shift experiment. 3. Microscope imaging. Temperature shift experiments were done using an inverted Nikon TE2000e microscope and a 100/1.45 oil immersion objective. Images were acquired using Metamorph 7.5 software for microscope and Hamamatsu CCD camera control. 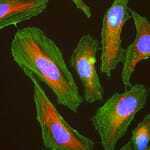 We used GFP-Atb2 expressing HeLa cells to track microtubules depolymerization. The field of observation was chosen to have a representative aspect of microtubule network in interphase and in mitosis. At 37°C, we observed spider-like microtubules network, which elongates from the MTOC. We also observed a mitotic cell with typical metaphasic spindles. Upon shifting temperature at 5°C for 6 min, we induced complete microtubules depolymerization. 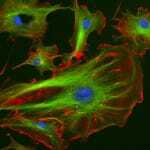 This was characterized by a drop in microtubules-associated fluorescence and an increase in cytoplasmic fluorescence. Indicating that tubulin dimers depolymerized and filled the pool of free cytoplasmic tubulin. When we shifted the temperature back to 37°C, microtubules network re-polymerized demonstrating the reversibility of this process. ElveflowTemp enables scientists to shift temperature from 5 to 45°C in 10 seconds. Existing temperature controller can take minutes (incubation box, microscope stages) to change temperature generating thermal gradient on the sample (>3°C). The quick action of our temperature controller allows scientists to induce and revert cellular phenotypes. We showed that we could fully depolymerize and repolymerize microtubules network within minutes. With our system, cell biologists can also slowly increment temperature and generate hypomorphic-phenotypes. 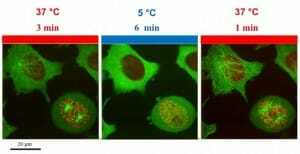 Developing a system that could reach below ambient temperature was an important requirement to enable to study vesicular transport, cytoskeleton or to perform high-resolution imaging. 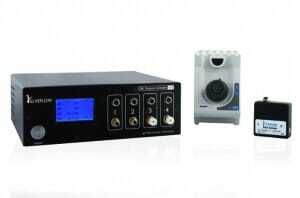 Temperature control intervenes in many cellular processes. With ElveflowTemp one can cold-induce endocytosis arrest, stop all vesicular transport and trafficking, induce protein recombination and track it with live-cell imaging, record the first steps of stem cells differentiation, induce and revert protein aggregation, induce heat-gated ion channel, track virus entry and trafficking inside the cells with microscope imaging. Need an accurate heater-cooler system to control Mammalian microtubule assembly ? Jeremy Cramer, study and characterization of a heater/cooler device: temperature control for cell biology, Master thesis, 2012.